A small box I’d been awaiting with some anticipation, was finally delivered by the postman. 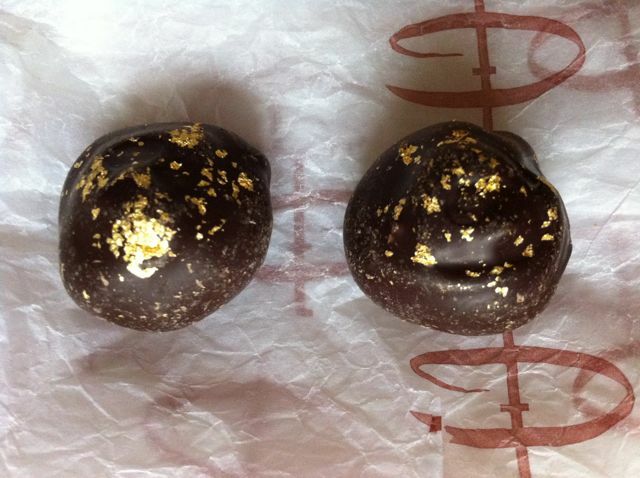 The Chocolate were sending me some of their luxurious dark chocolate truffles complete with real gold for review purposes. As I opened the box a wonderful aroma of fruity chocolate wafted upwards making me feel like I was in for a treat; this is a smell I associate with good quality chocolate. I was a little disappointed to find only two fairly small truffles in the box, but they were flaked in 24 carat gold and this gave them the lustre of real luxury. And sometimes less is more. Biting through the shell, I savoured their sophisticated dark, rich and not too sweet qualities. The chocolate was tangy with wonderful fruity notes and had a slight refreshing tartness about it. The beauty of these chocolates was more than skin deep, the smooth creamy ganache had a noticeably bubbly champagne persona. The flavours lingered on long after the chocolate had disappeared, another sign of good quality chocolate in my experience. These are handmade artisan truffles at their finest. The chocolate used is award winning Toscano Black 63% from Italy; the ganache ingredients are a closely guarded secret. Eating these chocolates make you feel good just by their sheer luxury and deliciousness, but you can find out more about the well-being benefits claimed for both the chocolate and the gold here. My only complaint was that two, just weren’t quite enough – CT didn’t get a look in! They look amazing, although I think it was mean of them only to send two. That sends them down in my estimation. ‘mean of them only to send two’ … At £190 a box, I would be delighted receiving 2 of these truffles for FREE. Looking good but I wonder if they are as good as Hotel Chocolat ones – I love those – ever tried them? very decadent, would love to try! chocolate AND champagne – what’s not to like!! Top notch chocolates – you’re so lucky to have tried them. Champagne & truffles who can ask for rmore?